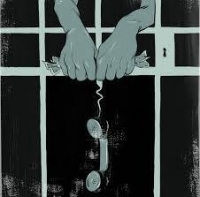 To expose phone companies charging exorbitant rates and bring justice to families who have loved ones incarcerated by making affordable the cost of phone calls from jails and prisons in Illinois. Those paying the high costs of phone calls to their loved ones incarcerated are featured in this video, “Kick the Kickbacks,” with a panel to follow moderated by Project NIA’s Mariame Kaba. Saturday, May 23, 2 p.m. This 17-minute video, “Kick the Kickbacks,” gives voice to Illinoisans who have paid thousands of dollars to companies such as Securus Technologies to talk on the phone to their loved ones incarcerated. Following the screening, we will have a special panel with some of those featured in the video moderated by Mariame Kaba of Project NIA. Free to the public. Light refreshments will be provided. Find the event on Facebook and like our page. 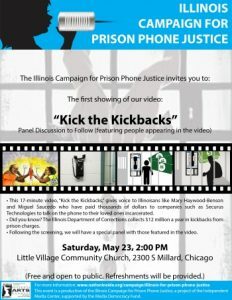 This event is a production of the Illinois Campaign for Prison Phone Justice, a project of the Independent Media Center, supported by the Media Democracy Fund.